then click on the Back button (top of screen) to return to this web page. Recent statistics show there are almost 8,000 dating sites worldwide and that more than 49 million Americans have tried online dating. Unfortunately, not everyone you meet on these sites is being honest and aboveboard. There are scammers out there who will tug at your heartstrings and take advantage of your search for love. Romance scammers are masters of "catfishing," the act of setting up a false personal profile for fraudulent or deceptive purposes. These profiles are often comprised of information, such as photos, names, addresses, etc., stolen from legitimate online profiles. Romance scammers will troll dating sites and tailor their profile to make themselves as attractive as possible to potential victims. In addition to online dating sites, romance scammers may also use social media or email to connect with potential victims. Whatever their initial approach, romance scammers will soon want to move your conversations to the telephone, email, or instant messaging, in other words, somewhere more private. They will take the time and steps necessary to gain your trust, but once they have set the hook, the requests for money, favors, gifts, and possibly things of a more intimate nature will start rolling in. Confidence fraud or romance scams ranked among the top 10 crime types reported in 2017 to the Federal Bureau of Investigation's Internet Crime Complaint Center. These scams resulted in losses to victims totaling over $211 million. There are warning signs to look for and steps to take to make sure a search for love and romance doesn't lead to heartache and financial ruin at the hands of a scammer. Scammers generally come on strong in the beginning and try to quickly move communications to email or private messaging, just in case their profile gets flagged or shut down. The information in their online profile may not match what they say or how they sound. Their messages are often vague and poorly written. Their camera never works if you ask to video chat. They always have an excuse or reason for why they cannot travel to meet you in person. One common scam involves the scammer asking for travel money, so they can come to meet you, and then never showing up. After gaining your trust, possibly over an extended period of time, they share an elaborate story that ends in a request for money, gifts, or bank account/credit card information. The scammer's messages become demanding, desperate, and persistent if you do not send money when they request it. Run an image search on the profile picture or any other pictures they send to determine if they are really who they say they are. Be careful about sharing personal pictures or videos with someone you have only met online. Never send money, gift cards, bank account/credit card information to someone you have only met online. Do not transfer money for someone else. Do not pick up or accept a package and forward it or deliver it for someone you have only met online. Tell family and friends when and where you are going if you agree to meet an online "friend" in person. If you think you have been a victim of a romance scam, report it to the website, app, or social media site where you met the scammer. Contact your bank and your credit card company if you provided the scammer with account information. Finally, report suspected scams to the Internet Crime Complaint Center at the Federal Bureau of Investigations. FDACS is Florida's clearinghouse for consumer complaints and information. The department's Division of Consumer Services will host a free webinar on March 8, 2019, from 1:00 p.m. to 2:00 p.m. (EST), titled FDACS: Making a Difference for Florida's Consumers. The webinar, held in conjunction with National Consumer Protection Week, will highlight the many ways the department works to protect consumers. I dentity theft is a continuous problem, with many of its victims unaware that their identity has been stolen until they are denied credit or sent a bill for purchases they did not make. This time of year, there is an increase in tax identity theft, which occurs when an individual's Social Security number (SSN) is stolen for the purpose of filing a tax return and claiming a fraudulent refund. Safeguard your information. Shred financial documents and paperwork, protect your SSN, never click on links sent in unsolicited emails, and keep your personal information in a safe place. Watch for suspicious activity by routinely monitoring your financial account and billing statements for any questionable transactions. Order a free annual credit report from each of the major credit reporting agencies (Equifax, Experian, TransUnion) at AnnualCreditReport.com. You are notified by the Internal Revenue Service that more than one tax return using your SSN has been filed within one year. You owe additional tax, refund offset, or had collection actions taken against you for a year you did not file a tax return. You receive collection calls or bills for products you or your family did not receive. You or a member of your family is denied government benefits because the benefits are being paid to another account using your or your family member's SSN. Respond against identity theft as soon as a problem is suspected. Place a fraud alert on your credit reports (Equifax, Experian, TransUnion), close any accounts that have been compromised or opened fraudulently, file a police report, and file a complaint with the Federal Trade Commission at IdentityTheft.gov. Respond immediately to any IRS notice. Call your local IRS office to verify any telephone numbers provided in written notices or, if instructed, go to IDVerify.irs.gov. Complete IRS Form 14039, Identity Theft Affidavit, if your e-filed return is rejected because of a duplicate filing under your SSN or you are instructed to do so. If you previously contacted the IRS and did not have a resolution, call the IRS Identity Protection Specialized Unit at 1-800-908-4490. For additional information, contact the Florida Department of Agriculture and Consumer Services at 1-800-HELP-FLA (435-7352), 1-800-FL-AYUDA (352-9832) en Español or visit FloridaConsumerHelp.com. The Florida Department of Agriculture and Consumer Services has created the "A - Z Resource Guide" to help Floridians find the most appropriate agency to contact for various issues. The "A-Z Resource Guide" is available online at FreshFromFlorida.com. The services offered to consumers are listed in alphabetical order, in addition to a search function that provides information about the regulatory agency and statutes, if applicable. This resource guide is available in English and Spanish. The department assists consumers regardless of whether we regulate the specific business or industry. If your complaint falls within our jurisdiction, we attempt to resolve your dispute and evaluate the business for compliance with applicable statutes. If your complaint is filed against a business that is not regulated by any federal, state or local government entity, we will attempt informal mediation to resolve the dispute. In the event that the complaint falls within another agency's jurisdiction, we will refer it to that agency. Before engaging in services with a business, it's also a good idea to research the business to see if it has any complaints filed against it and, if so, how they were resolved. To do this, consumers can utilize the "Business/Complaint Lookup" feature on our website. The Division of Food Safety monitors food from the point of manufacturing and distribution through wholesale and retail sales to ensure the public of safe, wholesome and properly represented food products. The Consumer Product Safety Commission provides consumer product recall information as part of the agency's mission to protect consumers and families from hazardous products. 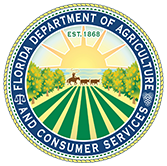 The Florida Department of Agriculture and Consumer Services is the state's clearinghouse for consumer complaints, protection, and information. Consumers who believe fraud has taken place can contact the department's consumer protection and information hotline by calling 1-800-HELP-FLA (435-7352) or, for Spanish speakers, 1-800-FL-AYUDA (352-9832) or visit us online at FloridaConsumerHelp.com.